iTunes Won't Install on Windows 10/8/7? Easiest Way to Fix! iTunes Won’t Install on Windows 10/8/7? Fix It Now! Many people have found it difficult to install or update iTunes on Microsoft Windows 10. Are you witnessing the same problem Fret no more! iTunes won't install issue is not from your PC but not able to uninstall all the files of the previous version of iTunes. Now, you can follow the steps below and be free from this situation. iTunes won't install because the previous version was not uninstalled correctly or iTunes components were not compatible with your Windows settings. All these can be repaired in one click with the help of iMyFone TunesFix, an cutting-edge iTunes repair tool. Auto-detect iTunes issues and fix "iTunes won't install" error. Also repair "iTunes won't update", "iTunes won't open", "iTunes couldn't connect to iPhone", "iTunes won't back up/restore", etc. Completely uninstall iTunes and its components in the right order, leaving no traces. Clean iTunes in one place, like to remove useless cache, cookies, logs, junk, used update files, old iOS backups, etc. Download and install iMyFone TunesFix on your PC. Open it and it will automatically detect your iTunes issues. 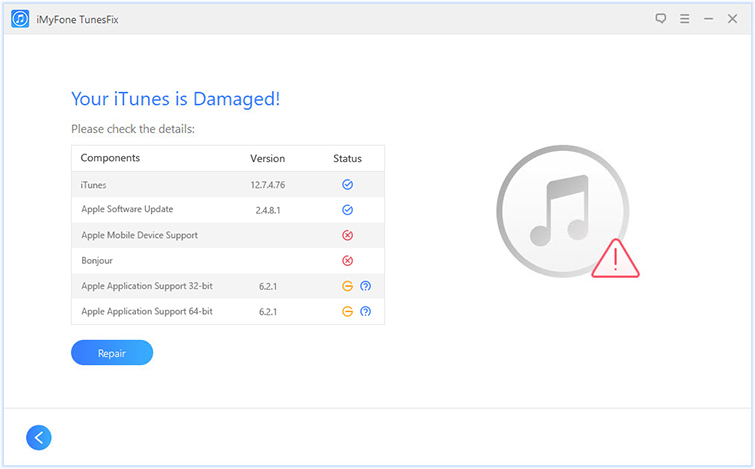 In this case, it will show you your iTunes is damaged. (You can check the details there.) Click Repair and it will help you to fix the issue and install the iTunes for you. Since it helps you to install the iTunes while repairing, you don't need to do the installation again. Or you can also try to completely uninstall previous iTunes and its related software components first. Then try to reinstall it. But note that, you should make the uninstallation in the right order, or the issue can't be fixed. What's worse, it will influence your PC performance. Step 2: Delete Mobile Device Support, Apple Application Support, and the CoreFP Folders if they exist. Step 3: Open the Local Disk (C:) located on the computer where your programs are installed. Step 5: For 64-bit version of Windows, Open the Program Files Folder and Delete the folders named iTunes, Bonjour, and iPod if they exist. Right click on the Recycle Bin and Select Empty Recycle Bin. Step 2: With a little scroll down, click on Download Now. Step 3: Click on Save and iTunes will now be downloaded to your computer. Step 4: When the download is complete, click on Run and the iTunes installer will open. Step 5: With the correct installation parameters, click on Install. Step 6: After the installation process, click on Finish . After finish the installation process, you'll be able to solve the problem of can't install iTunes. Don't Miss: Why My iTunes Won’t Open on Windows 7 / 10 ?